RBTH presents a selection of views from leading Russian media on international events, featuring reports on the NATO summit in Turkey, the significance of upcoming India-China talks for Moscow, and new developments in France’s far-right National Front party. The online newspaper Gazeta.ru reviews the meeting of foreign ministers of NATO member countries, which was held in Antalya, Turkey on May 13-14. The publication writes that the alliance is not only protesting against the annexation of Crimea and the Russian military build-up in the Donbass region of eastern Ukraine, as well as demanding that Moscow "use its influence on the separatists," but for the first time is also warning Kiev against an escalation of the conflict in the region. Military expert Alexander Golts told Gazeta.ru that the West would continue to "tug at" the Ukrainian leadership. However, he warns that a rapprochement between the West and Russia on the issue of Ukraine is unlikely: "The sympathies of the West are on the side of Ukraine, which is a victim of aggression," said Golts. Against this background, the Baltic states of Estonia, Latvia and Lithuania declared their desire to host several thousand NATO troops on a regular basis to defend themselves against Russian invasion, the website reports. However, Golts doubts that NATO will agree to change their previously formed plans. "The alliance adheres to a somewhat different course. In these countries, it has been decided to set up permanent headquarters and send troops there on a rotating basis – NATO's new rapid reaction forces," he said. Golts, however, did not rule out the possibility of troop deployment, noting that the request could be the beginning of long negotiations. Business daily Kommersant previews Indian Prime Minister Narendra Modi’s tour of Asia, the highlight of which will be his visit to China and talks with Chinese leader Xi Jinping. "The visit of the Prime Minister of India to China is not only capable of drastically changing the situation in relations between New Delhi and Beijing, but could also have a significant impact on the other leading economies of the non-Western world,” independent financial analyst Brian Young told Kommersant. “It is expected that during the summit the parties will take concrete steps to open access to each other's markets, having signed at least 20 agreements, measured in billions of dollars," said Young. According to experts, closer ties between India and China will give Moscow new arguments in favor of the idea of the long-standing strategic Russia-China-India triangle, the newspaper writes. "Given that the Sino-Indian summit will take place just two months ahead of the SCO [Shanghai Cooperation Organization] and BRICS summits in Ufa, the rapprochement of the two leading economies of Asia gives a new meaning to Moscow's initiatives for the restructuring of the global economy and the global financial system, as well as the security system, which will be discussed at the meetings in July, " Young said. The honorary chairman of France’s National Front party, Jean-Marie Le Pen, has announced that he is to organize a new political association of like-minded politicians, who are more inclined toward the old radical image of the party, but he does not plan to compete with Marine Le Pen, reports centrist newspaper Nezavisimaya Gazeta. His daughter, who succeeded him as the leader of France’s far right, has managed to turn the once fringe party into a promising political power, the newspaper writes. Marine Le Pen, however, understood the need for further work on the image of the National Front to consolidate its success in the political arena, and Jean-Marie Le Pen, who is not willing to move away from racist and anti-Semitic slogans, became an obstacle to this, writes Nezavisimaya Gazeta. Yury Rubinsky, head of the Center of French Studies at the Russian Academy of Sciences, told the newspaper that the creation of a new far-right movement by Le Pen will not damage his daughter's party. "The extreme elements in the electorate, who used to spoil the image of the Marine Le Pen-led party, will be sort of taken outside the brackets," said Rubinsky. 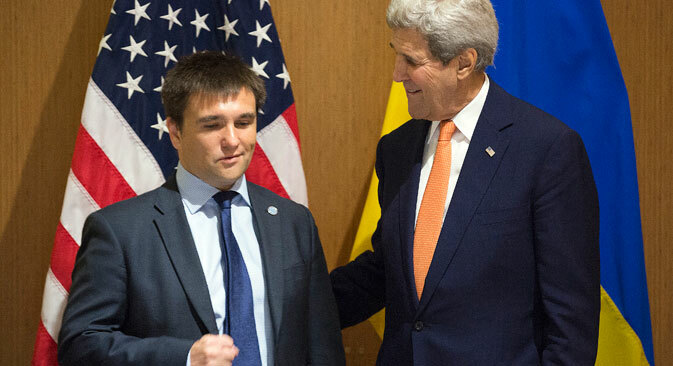 Talks with Kerry in Sochi: Will U.S. join Ukraine peace negotiations?